We are proud to be a Bay of Fundy Recommended Experience as awarded by the Bay of Fundy Tourism Partnership. This award is an earned designation and the Jolly Breeze is committed to sustainable tourism and quality whale watch experiences. The “Jolly Breeze of St. Andrews” is whale watch friendly. We shall maintain a recommended distance whilst viewing, however should they surface alongside the boat, we will consider ourselves lucky and move away slowly as soon as it is safe to do so. The Tall Ship has been running tours in St. Andrews since 1995 with experienced crew who are exceptionally talented at spotting the whales, know their feeding patterns and areas and how position the boat to get the best views for the day. We are all passionate about these amazing mammals and it is important that we respect their boundaries and the current laws and regulations. 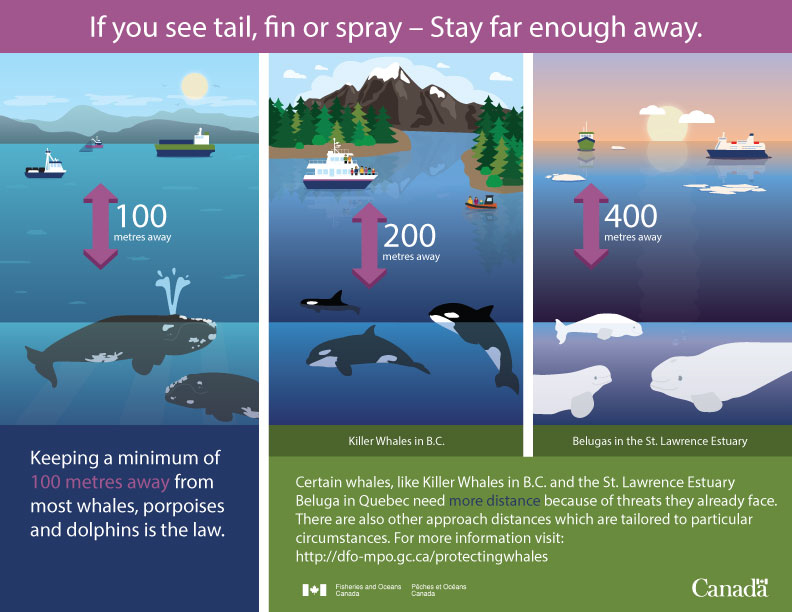 (This includes 100 meters for our area Bay of Fundy, 200 meters for West Coast Canada for Orcas, 400 meters for the St. Laurence Estuary Beluga whales). We strive to maintain the cost of the tickets at a more reasonable rate despite all the extra services we provide that go above and beyond such as the complimentary breakfast or homemade soup on the Tall Ship and the hot chocolate and homemade cookie on the jet boat. We also provide an extra crew person than required on the Tall Ship for improved service and education for the adults as well as the children. This includes all the added children’s activities (face painting, pirate costumes, steer the boat, Captain certificate, haul a sail) and the licensed bar for the adults. You will also note the added length of tour time of 3.5 hours on the Tall Ship and 2.5 hours on the Jet Boat so that the tours do not feel rushed. We believe in the importance of engaging people with the intense emotional connection with the amazing wildlife that the area offers and for that connection to help inspire people to make positive changes for the future and our environment. The homemade soup we serve is vegan and it is a vegetarian kitchen. The owners and many of our crew are vegetarian as well! This is a family run business with experienced local captains, passionate crew and biologists. We also contribute to the carbon offset program and numerous local charities for animal and human rights. We look forward to sharing this wonderful experience with including all the wildlife, numerous beautiful islands, wondrous tides, and don’t forget the added adventures of the Tall Ship and the Jet Boat themselves!